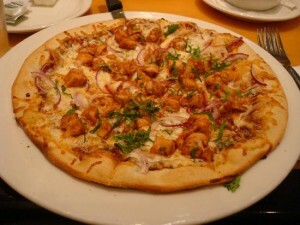 Bbq Chicken Pizza recipe by bestchefs at DesiRecipes.com. 1:Take a large bowl and combine all of dry ingredients with light hand first. 2:Then start making the dough of it bu kneeding very good...Kneed it for about 15 minutes and let it rise for about 2 hrs on room temperature. then preheat oven on 450*. 1:In Food processor add all of ingredient except julliened red onions, basil and mozzarella cheese.Mix it well in food processor. 2:Then Finally take dough and spread it in pizza pan or baking dish in which u intend to bake it..then pour Ketchup sauce on it and on it pour half mozz. cheese and over it add chicken topping and one more layer of mozz. cheese and top layer should be of julliened onions and basil .Place it inside the oven for abt 30 mins or until the pizza crust get golden brown.Remove from oven and serve hot. well i just wanted to ask how much of quantity of yeast would be required. recipie is nice but for making sauce 3 cups of catchup is too much.